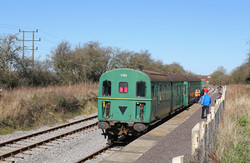 The Mid Norfolk Railway held a three day Diesel Gala event between the 5th and 7th April 2019. I attended the gala on Friday 5th April 2019. Staying in Norwich the railway can be accessed via a short train journey from Norwich to Wymondham mainline station, from here it is a pleasant and short 15 minute walk to Wymondham Abbey Station. Although there is a mainline link from the mainline to the preserved line, trains are not able to operate with passengers on board onto the mainline network. The line is 10.75 miles long and stretches from Wymonham Abbey at the south end of the line to Dereham at the north end, with Thuxton used as the passing location for trains running in opposite directions. The Gloucestershire and Warwickshire Railway held a home fleet Diesel Gala on the 6th & 7th October 2018. The GWR has probably the best selection of preserved former British Rail Traction in the country. With Two Class 37's, two Class 47's a Class 45, Class 24, and Class 20 there is something for everyone to enjoy. The railway extension to Broadway has now added an additional four miles of track to the line, which is providing a longer journey and more interest along the length of the line. I called into the GWR on the way back from the Severn Valley Railway Class 50 Jubilee Gala (as did many other Enthusiasts heading back to the South West), and paid a short visit to the line to view the progress on the Broadway Extension and ride through the wonderful scenery which the line offers. The Severn Valley Railway played host the biggest gathering of preserved Class 50 locomotives between the 4th to 6th October 2018. The Class 50 Golden Jubilee Gala had been the idea of the Fifty Fund to gather as many operational Class 50s together at their preserved spiritual home on the Severn Valley Railway, the event planned to celebrate the cult following the of the Class as they turned 50 years old. Examples of the Class were gathered from all over the UK. The biggest bonus of the event was the return to service of long term stored (and former National Railway Museum Locomotive) of No.50033 'Glorious'. In just over six months the locomotive was turned from a rusting stored locomotive with an unknown future, into an operational working locomotive by the Fifty Fund volunteers. The Chinnor and Princes Risborough Railway held a Diesel Gala Weekend on one of the coldest and wintry weekends of the year. I visited the line on Saturday 27th March 2018. 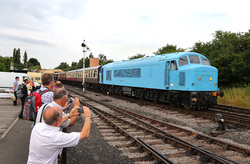 The event featured the return of recently restored Class 37 No.37227 by Graeme Watkins Railways. 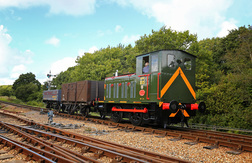 The locomotive is now based at the Chinnor and Princes Risborough Railway. Joining the Class 37 were the part restored Class 31 No.31163, Class 17 No.D8568 and visiting Class 33 from West Coast Railways No.33207. The line also used thier own Class 121 Bubble Car No.55023 for one short return trip to Wainhill and back. The day was bitterly cold with snow falling all day long, however it was well attended with the cafe doing a roaring trade with hot drinks, and bacon rolls being served all day long to keep enthusiasts warm inbetween trips to Princess Risborough. The Barrow Hill Round House has been on the the same site since 1870. Having been build as an original steam shed for the Midland Railway the 24 Road round house survived until closure of the final coal pits in 1991. Thankfully In 1989 Barrow Hill Engine Shed Society was formed with the intention of saving from demolition the Roundhouse on the site of the soon to be closed British Rail engine shed, and after extensive restoration the shed reopened as a preservation centre in 1998. Since then the centre has become an important centre of railway locomotive repair and restoration. As well as preserving the original round house, the sidings outside now provide ample storage for both preservationists, and mainline operators to store locomotives. The Mid Hants Railway held their Diesel Gala in the Autumn of 2017 between the 20th and 22nd October. Visiting Locomotives were also provided from other preserved lines to bolster the home fleet, all of which operated over the steeply graded 7 mile preserved railway. The event was well attended and offered good value to the Enthusiasts wishing to sample the traction over the steeply graded line. Trains were delayed on the Saturday morning after the first train from Alton slipped to a stand on the bank which delayed services for up to an hour. A timetable adjustment was made at the end of the day to ensure crews and locos still finished at the correct time. Below are a selection of images from the Hampshire based line. The Severn Valley Railway held their 30th Anniversary of Diesel Gala events on the 18th, 19th, 20th May 2017 providing a line up of 24 locomotives over three days. Organizers also hired in a rake of Intercity liveried Mk2 air brake coaching stock to provide extra capacity and to match with prototypical locomotives from the day. 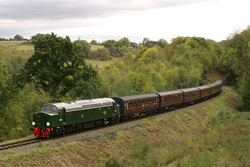 Crowds of enthusiasts descended on the 16 miles line to enjoy the sights and sounds of diesels from their youth, while many of the younger generation came to witness diesels of the present and future. The huge event was hailed a complete success with trains packed to the rafters with passengers on virtually every trip. 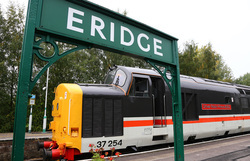 The festival highlights the importance of Diesel Gala events preserved lines, proving that with the right formula and pricing strategy and marketing and timetable that any diesel event can and should make money. The 5th 6th 7th May 2017 provided a feast of former British Railways Diesel Locomotives at the Swanage Railway for the 'Dawn of the Diesels' event. The annual diesel gala has fast become the premier Diesel Gala in the South West, with year on year success growing the core principles which draw in Railway Enthusiasts from far and wide. The 2017 event featured 10 visiting locomotives with class members from right across the British Rail spectrum. The tried and tested technique of combining Diesels, Real Ale, BBQ food, special edition etch glasses, special mugs for each event, late night Beer Ex services and driver experience works brilliantly and provides much needed additional income to the railway to help boost the takings throughout the three day event. During the early part of 2017 The Heavy Tractor Group returned their prize asset back into the 1990's sectorization period when the locomotive once carried Railfreight Metals livery. 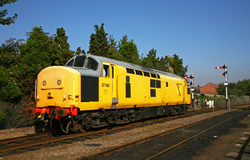 The heavyweight Class 37 is the first of its type to enter preservation and has been restored to a high standard. Having recently been named the locomotive was used on a Diesel Running diagram on the Great Central Railway on the 28th April 2017. Below are a selection of images from the afternoon running day between Loughborough and Leicester. The Isle of Wight Steam Railway held their first ever 'Shunter Shuffle, Diesel Gala' between the 30th September and 2nd October. The quaint island railway is known for its picturesque scenery and superb restoration of elderly locomotives and coaching stock, but had never previously held a Diesel Gala event. The home fleet of Diesels consisted of Class 05 No.D2554 (fresh from a rescent overhaul and repaint), Class 03 No.D2059 (03059) and Barclay 0-4-0 Shunter No.235. The line also took the step to bring in a Class 03 from the mainland, which was No.03197 from the Mangapps Railway. Together the small fleet provided a two train service, brake van rides and a small freight train. The heritage Island Line Tube Trains also stopped all services at Smallbrook Junction allowing passengers to access the railway via the passenger ferry from Portsmouth Harbour to Ryde Pier Head. The Epping and Ongar Railway is located at the far end of the London Underground Central Line near Epping. The preserved railway exists because of the former London Underground operation to Ongar, which was closed in 1994 shortening the Central Line back to Epping. If travelling by public transport arriving into Epping Station, passengers are then transferred on the Heritage London Buses and taken the short distance to North Weald Station. The former London Underground route is no longer linked, but in the future there may be a chance to bring the preserved line into Epping for a direct platform transfer between London Underground and the Epping & Ongar Railway. Diesel Gala Event provided a good selection of heritage diesels. Thursday 19th May to Saturday 21st May provided the largest gathering of preserved and mainline diesel locomotives on the Severn Valley Railway. Upwards of 20 locomotives were assembled for the event, while not all were operational it was a huge undertaking to get so many locomotives onto the railway for the three day event. The Severn Valley Railway know how to make the best from Diesel Gala weekends and the railway was packed to the gunnels with enthusiasts wanting to travel behind the heritage and modern diesels. I attended the event for the Friday and the Saturday and while the weather was somewhat inclement below are some of the images taken over the two days. The Avon Valley Railway near Keynsham held a small Diesel Gala Weekend on the 12th and 13th March using as many of their operational diesel locomotives and industrial shunters as were available. The Gala weekend also marked the debut of restored BR Blue Class 08 No.08202 on the line, working alongside BR Blue classmate Class 31 No.31101 The Avon Valley Railway is part of the otherwise-dismantled Midland Railway Mangotsfield and Bath Branch Line, which was closed during the late 1960s as a result of the Beeching cuts. The railway is perhaps best known for connecting the former Somerset and Dorset Joint Railway (S&DJR), whose northern terminus was at Bath Green Park station, with the London, Midland and Scottish Railway (LMS). Between the 8th and 10th May the Swanage Railway turned their railway over to the diesels for four days of classic traction in Dorset. Combined with the annual Corfe Castle Beer Festival the line revels in the use of Diesel Locomotives operating between 09:30 and 23:30 most nights of the gala. The event is always well attended and provides stunning scenery, along with lots of locomotives from various periods of railway history. The 2015 event was very well attended with large crowds of people who turned up to see the array of locomotives on offer from the Swanage Railway. The weekend of the 21st and 22nd March saw the Swindon & Cricklade Railway hold a home fleet diesel gala using their ecliptic mix of Diesel Locomotives currently on the line. The preserved line is only 2.75 miles long, but hosts a wide variety of locomotives and stock, and a plucky band of volunteers who try to keep everything running. There are also plans with expansion to build an end station (close to Taw Valley Halt) next to the Swindon - Gloucester mainline which will undoubtedly bring in much needed revenue to the line. The line may also be helped by the relentless house building which is being carried out in the Swindon area, which thousands of new homes now closing in around the line. The 2nd to the 4th October saw the Severn Valley Railway hold another superb Autumn Diesel Gala. A feast of former mainline diesel locomotives were on offer for the general public and enthusiasts to enjoy. Many of the locomotives are now between 40 and 50 years old, but continue to be cared for by loving volunteers and owners. The SVR event was hugely popular with visitors, providing three days of British built heritage diesels operating over the sixteen mile route. 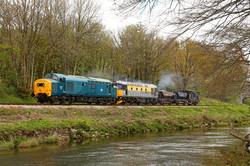 The Bodmin and Wenford Railway held a heritage diesel operating day on the 27th September 2014, the event was also supported by Colas Rail Freight who offered the use of a Class 56 for the day. 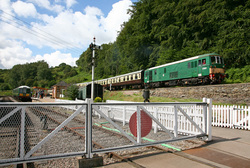 During Friday 26th the locomotive worked into Cornwall light engine from Cardiff Canton Depot. The event coincided nicely with the need to collect a stored Class 60 locomotive from St Blazey Yard. The Class 60 having previously been owned and operated by EWS/ DB Schenker was now in the ownership of Colas Rail Freight. 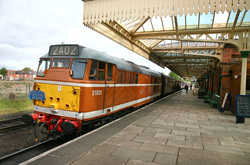 After collection from St Blazey Yard the Class 60 was stabled at Bodmin Parkway to compliment the diesel operating day. 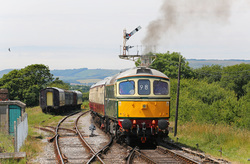 Three locomotives from the Bodmin Diesel Group were also in operation, Class 33 No. 33110, Class 37 No. 37142 and Class 47 No. 47306 'The Sapper'. The 21st, 22nd July saw the Gloucestershire and Warwickshire Railway hold their popular Diesel Gala Weekend. The line now benefits from an extension to Laverton (soon to further extend to Broadway) making the line some 11 miles long. Two locomotives took centre stage at the event. Class 45 No.45149 appeared for the first time in BR Blue livery, and D7017 (visiting from the West Somerset Railway) provided a former locomotive type which would of operated over the route in British Rail days. The GWR has gone from strength to strength after it's long period of disruption caused by two major land slips at Chicken Curve and Gotherington. The periods of inactivity allowed other groups based on the line to concentrate on other projects, all of which have now come into fruition. The Swanage Railway held their annual 'Diesel Gala' on the 8th and 11th May 2014. 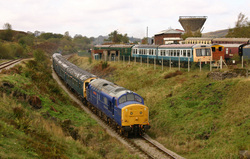 The event has grown over many years to be one of the premier events on the Diesel Gala calender. The 2014 event was further enhanced by a 'Network Southeast' theme, which resulted in prototypical operations and much Network Southeast branding being used throughout the line. A nice touch was the revised station name boards, clearly a lot of thought had been put into this years theme! Below are a selection of images taken during Saturday 10th May with better than expected weather. 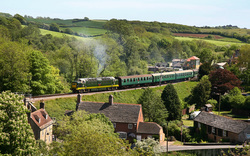 The South Devon Railway held a 'Easter Heritage Gala' over the 2014 Easter weekend, which included both steam and diesel traction, and was themed as 'Delivering the Goods'. The line had one visiting steam locomotive in the shape of LMS 2-6-0 2MT No.46521, another recent arrival to the line was Class 37 No.37275 which will was transferred from Barrow Hill in a deal to exchange it with Class 20 D8110. Many different freight trains were formed up during the operating weekend which gave a nice touch of 'imagination' from the SDR managment, something we wouldn't see happen on other preserved lines in the South West. The South Devon offers some fantastic views alongside the River Dart as the line meanders between Totnes and Buckfastleigh. Saturday 15th and Sunday 16th March 2014 saw the Swindon and Cricklade Railway hold a Southern Reigon themed Diesel Gala event. The line is only 2 1/4 miles long but has hopes to expand to both Swindon and Cricklade in years to come. It currently operates between Hayes Knoll, Blunsden & Taw Valleey Halt. Two locomotives and one DEMU operated during the two day event. Class 73 No.E6003 (73003) 'Sir Herbert Walker', Class 09 No.D3668 (09004), and Class 207 'Thumper' No.1302 (207203) provided a two train timetable throughout the weekend. The 26th - 28th July saw the G&WR hold their first three day Diesel Gala Weekend since the line was split into three sections following landslides in 2010. It's been three years since the line has been able to hold a Diesel Gala over the whole length of the line, since then the two landslip sites have been repaired and the northern extension to the line as now reached Laverton Loop. The event also featured newly restored Class 45/1 No.45149 and Class 26 No.26043. Sadly the Class 26 failed twice on Saturday with traction motor faults. However although 45149 did have a couple of issues it was able to continue throughout the event. The gala also used 47376, 73129, 20137, 24081 and 37215 giving a wide selection of diesels for enthusiasts to enjoy. 47105 and 37248 were both on display in the diesel group shed at Toddington. Below are a selection of images from the event. Having spent four days in the North West of England photographing a move from York to Tunbridge was made on the the 17th October, after traveling to London with East Coast, crossing the capital and then traveling to Tunbridge with South Eastern we arrived into Tunbridge Wells by 23:00. The move allowed us to attend the Spa Valley Railway Diesel Gala Weekend & Camra Real Ale Festival. Former Cardiff Canton Class 37 No.37254 was in action along with visiting locomotive No.31206. Below are a selection of images from the day on the Spa Valley, a line which now boasts mainline connections at both ends of the line!! 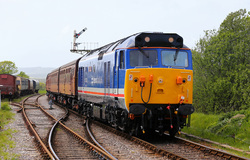 May 10th – 12th provided the annual Swanage Railway Diesel Gala, an event which has proved year on year to be a major part of the UK Diesel Gala events. 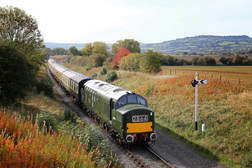 A few changes were made to the 2013 event, including the relocation of the Beer Festival to Corfe Caslte, redesigned timetable to allow for more services, and simplified operations at Swanage and additional catering facilities at Nordon. The Great Central Railway held another Deisel Gala on the 7th, 8th and of September. Having visited the GCR in 2011 we had such a good time we decided we would return in 2012 to make the most of the event, staying Friday and Saturday night in a local B&B. The three day event was blessed with exceptional weather for the time of year. We arrived on the line during the evening of the 7th before using a two day rover ticket to get to various locations along the length of the line. The Great Central runs between Loughborough Central and Leicester North passing Quorn and Woodhouse, and Rothely on route and is currently 7.75 miles long. The Pontypool & Blaenavon Railway is a brilliant preserved line situated in the high in the Welsh Valleys with line gradients at 1 in 42 and up to 1 in 24 at one point on the line. The friendly atmosphere and enthusiastic spirit of volunteers on the line always make for a good day out. The 2011 Diesel Gala weekend saw 37216 (mid restoration), 37219 (Mainline Blue), D5627/31203 (BR Green) and 73128 (EWS) team up to provide multiple trips over the steeply graded line. The Thursday before the gala there were only two working diesel locomotives working on the line so great thanks should be extended to the volunteers who put in the effort to get the remaining two operational. The Severn Valley Railway held their 4 day Diesel Gala between the 6th and 9th of October hosting a variety of traction for enthusiasts to enjoy. Rather than driving to the event, we opted for a full day of train travel via Brimingham New Street and Smethwick Galton Bridge on the way, and via Birmingham Moor Street (with a walk to New Street) on the way back. The Limited time at the event was not helped by the failure of 50031 on the 10:25 from Kidderminster to Bridgnorth, which failed near Northwood Halt delaying services by up to 45 minutes. This gallery features images from the day, while not many lineside locations were able to be used we did at least make use of those we did visit. The Great Central (North) is very much a railway in its infancy with a main base at Ruddington the preserved line joins a spur at Ruddington South Junction and via requires a reversal to access the line to Rushcliffe Halt and Loughborough. Currently there is no station at Loughborough but East Leake (also known as Rushcliffe Halt) provides a place to change trains. The GCRN also has a mainline connection which generates Gypsum Traffic from the mainline network. The total length of the line is 8.25 miles, which is slightly longer than the Great Central Railway! The Great Central Railway held a joint Diesel Gala with the Great Central Railway ‘North’ on the 14th and 15th May 2011 with a free bus link between the two railways. This was the first time the two railways (split by the current Midland Mainline) had decided to hold a joint event. The prospect of nearly 20 locomotives to photograph and ride behind provided good crowds at both events over the weekend. Having not visited the GCR since 2005 it was time to make the most of unique gala weekend. The Great Central runs between Loughborough Central and Leicester North. The 6th, 7th and 8th May 2011 heralded the annual Swanage Railway Diesel Gala weekend, with combined Beer Festival (at Harmans Cross). The event has slowly built up a good reputation over a number of years, providing good transport links to both Swanage and Nordon late into the night. The three day has become one of the major persevered railway events in the South West, and as such draws crowds from a large radius that come to photograph and ride diesel locomotives from their era. The 5 mile line provides a model template for diesel galas which many other lines in the South West can take note of. A good wide selection of diesels from of various ages, a regular timetable, BBQ’s, Beer, Good food and evening dining at reasonable prices, and good value rover tickets which are popular with many enthusiast.